First, a note of explanation: What follows is not a post on “getting things done” or on the merits of various productivity tools. It is, rather, some thoughts on the ways I’ve found those tools to shape my thinking and my work. After almost four years of trying to keep track of all my various projects with various apps, I’ve given up and gone back to a combination of a paper journal (hardbound, dot-printed rather than lined) and, for long term planning of specific projects, various homespun electronic documents and spreadsheets. It’s working wonderfully; I find I’m far better able to keep track of what I’m doing and what I’ve done. Having made that change, here are some of my observations. Apps swallow their past. Once you check an item off as completed, it disappears from view. There’s nearly always a way to retrieve that information, but not typically in a way that I find conveniently displayed. Loose sheets of paper are worse; they get thrown away. A journal, as long as you mark entries rather than crossing through them, preserves the past in readable fashion. That’s of some practical value: I can, for example, see when I last gave the dog her heartworm preventative or note a tendency to put off certain tasks. I can learn from my mistakes in a way that’s impossible if I hide or erase or throw away (or even cross through) what I’ve done. But there’s also something philosophically worrisome to me about the ease with which productivity apps move you inexorably into the next task. It encourages presentism, an emphasis on what’s important now and on what’s next, and I think the culture already encourages far too much of that. Hardbound journals, by contrast, encourage reflection and a vision of oneself as a whole over time. An app, no matter how flexibly it’s designed to be used, is inherently algorithmic. Computer code is algorithms. And if I’m using that code, I, too, have to follow the algorithm; my own thinking must shape itself to the algorithm. Now, it’s true that processes of work must always adapt to fit the tools at hand, but some tools are more flexible than others. Blank sheets of paper, dotted rather than lined, bound into a journal, give me tremendous flexibility. I can choose my own symbols and systems, index as I wish, organize as suits my preferred ways of thinking, planning, remembering, and visualizing. As my thinking about my thinking evolves, my processes can evolve with it. With an app, I’m stuck in someone else’s head. (There’s also a difference, I think, between a tool and an algorithm, but that needs more thought.) A simple table in an Open Office document serves that end when paper doesn’t. There is some satisfaction to writing, physically writing, the X next to a task completed. It serves the same purpose as checking a box on a computer screen and watching it disappear, and so they may be functionally identically, but to claim that the two actions are thus identical and interchangeable reduces human experience to mere functionality. I’m not an algorithm (see #2, above); I have a body, and I think with it. 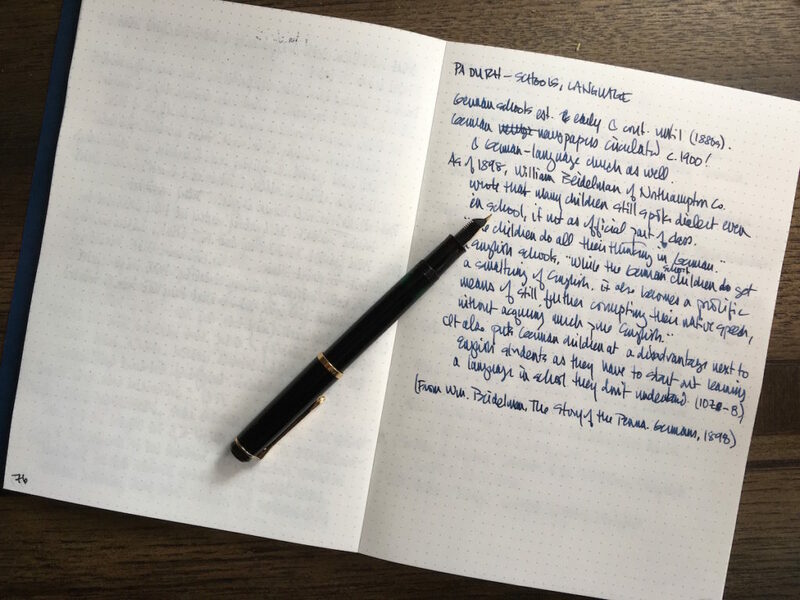 I buy the blank books and ink for my fountain pens from a local stationary shop — yes, I still have a local stationary shop, an amazing thing, and I’d like to help keep it in business! Both come ultimately from some company or other, I don’t know where. (France?) So I’m not claiming any sort of purity. But to use them, I don’t have to support my cable company, my phone company, or one of the world’s largest global corporations (e.g. Apple). And when I stock up I get to have a chat with a guy who calls himself, professionally, Crazy Alan. So there’s that.